WASHINGTON (Reuters) - U.S. President Donald Trump on Monday ruled out agreeing to any demands from Turkey to gain the release of a detained American pastor and said he was not concerned that his tough stance could end up hurting European and emerging market economies. 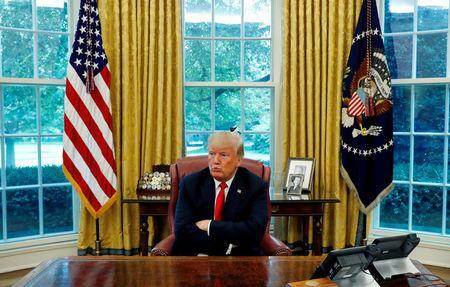 In a wide-ranging Oval Office interview with Reuters, Trump complained about interest rate hikes by the Federal Reserve and suggested he was having second thoughts about Jerome Powell, his choice for Fed chair. He also said he "most likely" will have a second meeting with North Korean leader Kim Jong Un and indicated he would consider lifting U.S. sanctions on Russia if Moscow took some actions in return. Trump drew a barrage of criticism at home and abroad after he stood side by side with Russian President Vladimir Putin at a July 16 summit in Helsinki and cast doubt on his own intelligence agencies' findings that Russia meddled in the 2016 U.S. elections. The Iranians, including Supreme Leader Ali Khamenei, have dismissed the offer. Trump said it did not matter to him whether he met Iran's leaders and that there had been no U.S. outreach toward Iran to discuss talks.